Professional Tree Services in Newcastle, Lake Macquarie, Hunter Valley, Port Stephens, Warners Bay and surrounding areas. "Our focus is to provide a safe and reliable tree service from the first point of contact, right down to the last leaf." Our Trees - Our Knowledge. Call John and get the professional arborist advice you need! Our staff are professionals who have the training and experience to safely and effectively prune and remove trees, as well as taking the utmost care around your property. We view every tree, plant or part of your property as an asset, and put into place systems that ensure no damage. We have a comprehensive Workplace Health & Safety Policy. This Policy takes into account the staff members, providing a clean and safe environment for our workplace and its members. The standard of training we offer to our staff is very high, promoting safe work practice. All staff have been trained in their respective tasks and are audited to ensure safe operations. 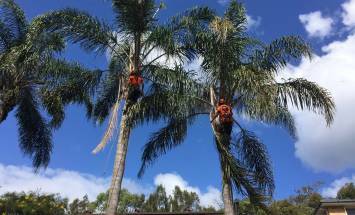 We provide tree services all over Lake Macquarie and surrounding areas. Our responsibilities are taken seriously when it comes to our staff, the public and the environment. Work is never undertaken unless a safe site has been established, taking into consideration all of the above conditions. We truly believe we are achieving excellence in arboriculture. At Cutting Edge Tree Maintenance We want you to experience our commitment to quality for all your tree care needs. Why use anyone else but a tree expert and arborist when you need your tree job done right? We offer a full range of arborist tree services to serve you and your landscaping needs. And best of all…..we love trees! Any tree removal would be after careful consideration of all available options. Consultations. Do you have a question about tree care? Do you need someone to visit your property for a personal inspection? At Cutting Edge Tree Maintenance we will happily answer your question(s) or send out one of our team arborists right away to give you an expert recommendation or diagnosis. Even if it’s just for aesthetics, lawn or shrub care, we have yet to be “stumped” on any tree care issue yet in our many years of experience. Dead Wooding and Pruning. These two tree services are usually done together to keep a tree healthy and fit. Proper Care and maintenance for trees usually means at least once or twice a year for this service. Don’t trust pruning to anyone but a qualified arborist from Cutting Edge Tree Maintenance. Remember tree pruning is the number one way an inexperienced property owner can do the most damage to a tree. Don’t risk it – call Cutting Edge today. Hazardous Tree Assessment. Do you know what constitutes a hazardous tree? We do. Looking out for any tree that could possibly pose a danger now or in the future is one of our specialties. Let us help you assess any dangerous trees on your property. It’s not worth the risk to your family or property when hazardous trees can be identified and taken care of quickly. Stump Grinding and Removal. To remove or not to remove…..that is the age old question! You may think it will give your yard a natural rustic look, but our answer is most definitely yes. Remove it and save yourself a lot of trouble down the road. We’ve come up with six excellent reasons for removing old tree trunks and stumps on our stump grinding page. Tree Diagnostics and Treatment. When you have a sick tree you want a tree expert and arborist to give you a proper diagnosis and treatment protocol. Tree removal is always the last option. Trees are living things that can contract different ailments and diseases. Your tree will be in good hands with one of our trusted tree experts. Tree Removal. As we’ve said before, we love trees and our main goal is to keep them healthy and fit. However, sometimes tree removal is the only option. When this is the case the safety of you, your family and your property is our main concern. You’ll want an experienced team of tree care experts from Cutting Edge Tree Maintenance that have the best state of the art equipment to remove your trees without worry. We are the most trusted tree removal service in Newcastle. Do you need a hazardous tree removed that is encroaching on your home? Do you have a large tree that needs dead wooding? Give us a call and we will provide you with a free quote. We are skilled arborists that have been providing professional tree maintenance services for decades, so we know exactly the questions to ask to ensure that we can provide you with an accurate quote over the phone. If you would rather send us an email, just visit our contact us page and we will reply as soon as we can. Our quotes are genuine, with no sneaky additional charges or fees. Over the years we have completed thousands of incident-free jobs. We use above industry standard safety precautions and constantly refine our processes to ensure that we can provide a safe and professional service. In order to provide you with peace of mind, we are fully insured with public liability insurance. We have always endeavored to provide a hassle-free experience. We will treat both you and your property with the utmost respect. Don't rely on an amateur to remove a tree from your property. Our Workers Compensation and Public Liability insurance covers your home or office, neighboring properties and any potential damage. Make a savvy decision and rely on the industry experts. Our team consists of fully trained and qualified arborists. We have spent years mastering our techniques and skills to guarantee that we can safely and effectively provide professional tree services. Whether that requires us removing large trees from your property, or providing advanced tree pruning services, we have the staff, equipment and experience to more than meet the challenge. We are only satisfied when you are satisfied. We can undertake tree work at the highest level. Our arborists have been hand-picked for their unique skills. We work as a team to ensure that we can provide cost-efficient services for our local community. As members of the Newcastle community, we take pride in making your trees and yard look great. 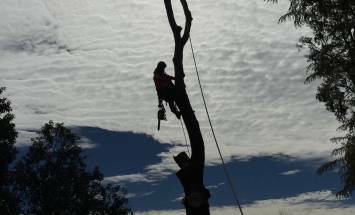 Cutting Edge Tree Maintenance is a small team of fully qualified arborists (also known as tree surgeons, tree loppers and tree maintenance professionals) from the Newcastle region. We service all suburbs in the Newcastle, Lake Macquarie, Hunter Valley and Warners Bay regions. With a reputation for exceptional workmanship, we are one of the leading Lake Macquarie tree removal teams. No matter the size of the job, we can handle it! We have provided first-rate tree maintenance services for both residential and commercial properties. Homeowners love us for our great rates. Commercial customers love us for our hassle-free service. If you have any questions about how Cutting Edge Tree Maintenance can help you, don't hesitate to call us on 1300 288 873. Our chippers and stump grinders are as powerful as you can get in Australia. When we say we are prepared for any job – we mean it!. As we have to rely on our safety equipment every day, we only invest in the safest. All of this industry-leading equipment means that we can get your job done quickly and without incident. Not only does this mean that we can complete your job promptly, but we can also offer you great rates. We are not Australia's biggest tree removal company and we do not want to be. Our goal is to provide cost-effective tree maintenance services in the Newcastle region. Our small overheads ensure that we can keep our rates low without sacrificing quality. Our skillful team allows us to quickly complete complex jobs and offer you discount rates. For a free quote, call us on 1300 288 873. We know you will be impressed with our competitive rates. We are proud to have the reputation as the #1 team of arborists in the Newcastle region. It has taken us more than a decade to assemble a team that provides the highest standard of professional tree care in the region. We have invested in the industry's best equipment and we are sure that our results speak for themselves. The majority of our jobs are recommendations from previous customers. We continue to refine our processes and improve our skills to ensure that we can remain the leading tree maintenance team in Newcastle. We provide a complete range of tree removal and maintenance services. Some of the services that we offer include dead wooding, tree pruning, hedging, palm removal, stump grinding, tree lopping, land and site clearing, tree diagnostics and treatment, hazardous tree assessments. We have close working relationships with local councils and provide professional arborist services. If you have a tree problem, we can solve it. We know that our results are only as good as the professional customer service that we provide. As fellow residents in your community, we respect your time and property. We will arrive on time and ensure that your yard is left clean. We provide clear and understandable communication so that you know exactly what we are going to accomplish. Our goal is not just to get the job done, we want you to be more than satisfied with our service. We are a locally owned and operated Newcastle business. We are passionate about providing professional and reliable tree maintenance services in our community. Our team of arborists is based in Warners Bay, but we service the entire Newcastle, Lake Macquarie and Hunter Valley regions. Raymond Terrace, Charlestown, Wallsend, East Maitland, Merewether, Rutherford, New Lambton, Mayfield, Medowie, Thornton, Maryland, Warners Bay, Belmont, Edgeworth, Cardiff, Adamstown, Valentine, Eleebana, Toronto, Elemore Vale, Adamstown Heights, Cameron Park, Metford, Swansea, Waratah, Ashtonfield, Stockton, Hamilton, Kotara, Shortland, Cooks Hill, Gateshead, Glendale and Mount Hutton. The majority of our jobs come from recommendations from past customers. If you search for us online you will see that we are highly recommended both in the industry and the community. 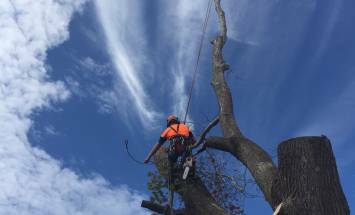 Cutting Edge Tree Maintenance is determined to provide the highest standard of arborist services in Newcastle. Read our genuine customer testimonials below to see why we are Newcastle's #1 tree loppers.